The Tecfarm Draper Conveyor design is well proven in the field. The same assembly is fitted to all Smartcarts and can upgrade an existing fan type cart to a high capacity unit suited to today’s large headers. The kit is complete; assembled ready to fit, with WCCO brand guided belts, full side windguards, two hydramotors in series, (one powering each belt), hoses to the supplied Flow Control and weld on mounting brackets for attaching to a modified cart. 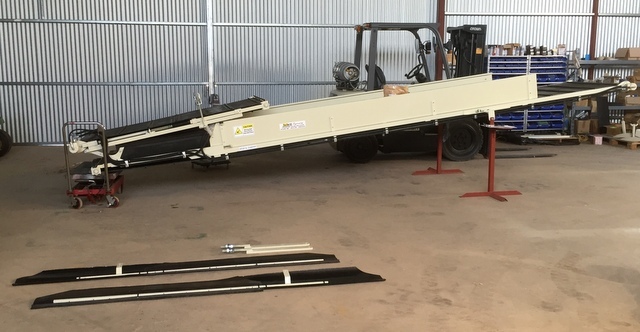 The Tecfarm Conveyor is competitively priced at $18,500 + GST ex factory. Older chaff carts can be converted successfully but consideration should be given to the overall condition and size of the unit before undertaking the necessary modifications. Some convert better than others.